IN THIS EDITION: New Pricing Tool for Your Website; Record Volumes Traded on Mercaris Platform in First Half of 2017; Pricing Survey Expansion. View this email in your browser. We are pleased to announce a new, free tool to track organic grain prices: a table (called a "widget") that displays up-to-date price information- right on your company's website (see below). Albert Lea Seed hosts our widget on their organics site, and you can too! Click here to view. If you'd like to increase the number of visitors to your website, and provide a valuable service to your customers and stakeholders, free-of-charge, please contact Julia Hofmeister. In the first half of 2017, more than 370,000 bushels of organic, non-GMO, and transitional grains were traded on the Mercaris Auction Platform, more than tripling total 2016 quantities. Our platform continues to grow as buyers expand their markets and sellers find new sources of grain demand. Since the launch of the Mercaris Auction Platform, farmers, merchandisers, mills, processors and brokers have traded more than 650,000 bushels of organic, transitional, and non-GMO grains, with a total notional value of nearly $5 million. 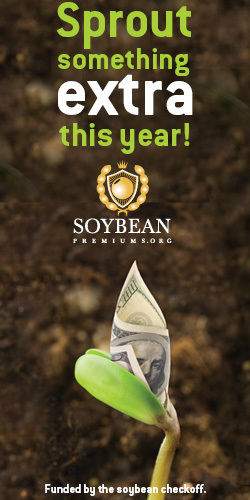 To access prices and quality specifications of past auctions, or to buy or sell grain via the Mercaris platform, create a free account at www.mercaris.com, or contact our Director of Market Operations, Lizzie Ekeberg. 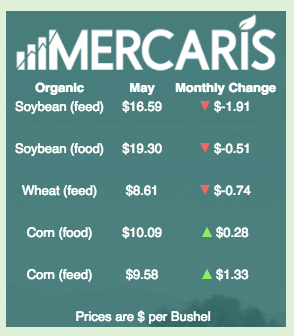 Mercaris has finalized its annual commodity reports on organic & non-GMO corn, soybean, and wheat. The reports are designed to give a strategic overview of these crops, and cover acreage, demand-side analysis, price trends, and other macroeconomic factors that affect these markets. In addition to our Annual Sector Reports, this year Mercaris also released a comprehensive, research-based white paper on the organic dairy market, with a focus on the various classes of dairy that result from processing fluid milk. This report analyzes supply and demand components of the market for various classes of organic dairy components including beverage/fluid milk, yogurt and cream, cheese, milk powders, and butter. It also delves into the structure of pricing and contracting practices and includes information on dairy processing infrastructure, logistics and economics. Contact us if you'd like to access any of these reports. Throughout Q2, the Mercaris team has been busy expanding our market survey and data offerings to include organic and non-GMO soybean meal, soybean oil, and canola oil. If you work with any of these, we would love to have you join our survey! Please contact Rachel Storey to learn more about how you can join our survey and receive complimentary access to Mercaris data. Mercaris is currently looking for a Junior or Senior Economist to join our team. If you are interested in learning more about this opportunity, please visit our Careers Page.